Once such test method comes from ISO 846 “Plastics – Evaluation of the action of microorganisms”. This method is specifically used to determine the threat from deterioration of plastics as a result of a direct microbial attack on nutritive substrates as well as an indirect attack from microorganisms fueled by contamination on the substrate. From ISO 846 we will focus on Methods B: Determination of Fungistatic Effects. 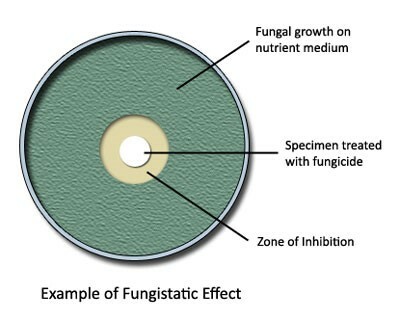 Fungistatic Effect: The antimycotic (antifungal) effect of an antimicrobial treatment which prevents a given material from being overgrown by fungi under moist conditions. Specimens using fungicidal treatment are “challenged” by being exposed to a mixed spore suspension in the presence of a nutrient medium. If the fungicidal treatment is ineffective, fungi can grow over and attack the specimen leading to eventual deterioration. With an effective fungicide there will be no growth on the specimen and possibly no growth on the nutrient medium in the area directly surrounding the sample. This clean area is known as the “zone of inhibition”. The size of the zone of inhibition indicates the strength of the fungicide. The method above has proven to be valuable when experimenting with the percentage of fungicide to use in the material formulation. 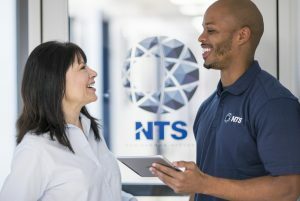 At NTS Tinton Falls, we have the expertise to carry out microbial challenge testing to provide you with the peace of mind that your product will meet your customers’ expectations for life of the product. For questions, contact our laboratory manager Tom Borrelli via email at tom.borrelli@nts.com or call 732-936-0800. 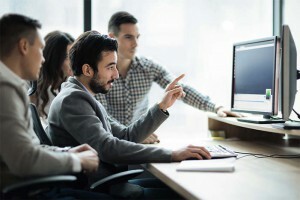 You can also simply request a quote with our quick form!